This year marks the 25th anniversary of desktop innovation. During that time, the world’s most secure commercial PCs have continuously redefined “less is more” with revolutionary form factors that deliver increased elbowroom while providing reliable, intelligent performance and flexibility that allow users to truly work the way they want. Now Dell OptiPlex has cleared the path to outstanding productivity even more with the launch of the newest Dell™ OptiPlex™ Micro and All-in-One. 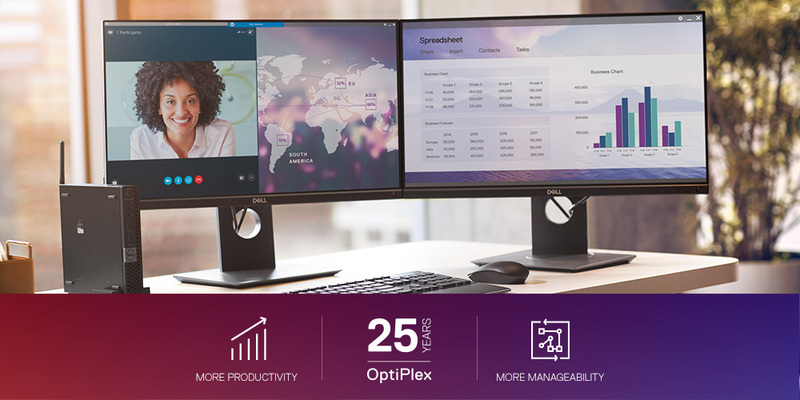 On top of their innovative form factors, opulent views and collaborative advantages, the new OptiPlex Series provides more mounting options than ever, and integrative designs that allow ecosystems to adapt to the new ways people work. In addition, they come packed with performance-enhancing features like the latest 8th Gen Intel® Core™ i7+ vPro™ processor – a combination of the greater security and productivity via vPro™ CPUs and Intel® Optane™ memory, the smart and adaptable system accelerator. This provides an unparalleled amount of high throughput, low latency, high-quality service and high endurance. This helps your customers save room, resources, time and money – all while delivering the ultimate in versatility for desktop users. According to a recent Forrester report, 52 percent of PC buyers cite space utilization as a top challenge when it comes to traditional desktops1. As the need for office space steadily increases, the demand for micro PCs has never been greater1. Perhaps that’s why 72 percent of IT decision makers (ITDMs) are either maintaining or increasing their investment into micro PCs1. It’s safe to say that, with 81 percent of workers using a desktop as their primary computing device1, the desktop is still a key business tool. From smart classrooms to call centers to doctor offices and beyond, the new OptiPlex Micros are designed to transform any workspace into a space-saving environment that encourages greater employee productivity. The all-new OptiPlex AIO series is comprehensive, to say the least. It’s fully featured design comes in small form factors that deliver an impressive interface and security solutions. So whether it’s desk work, working remotely, dashing between conference rooms or a combination of all of them, these OptiPlex AIOs offer superior manageability and can accommodate an extensive portfolio of peripherals and services to give users a superior desktop experience in any of these scenarios. Add energy-efficient, award-winning Wyse thin clients and software to suit any budget, application or performance requirements. Designed for cost-effective virtual desktop deployments, the All-in-One thin client delivers great value from day one with minimal initial investment and power-efficient operation. Manage all Dell systems simultaneously across the globe, regardless of their IT method (SCCM, Kace, LANdesk, etc.) with unique one-to-many Intel® vPro™ capabilities that allow significant time reduction for remote manageability through its Remote Provisioning Tool. Maximize hardware investments, increase efficiency and reduce time spent on manual, error-prone tasks. 21 fewer steps to resolution. We’ve built a set of marketing assets that will help expand your revenue potential by putting you at the forefront of your customer communications when explaining the benefits of the new OptiPlex Micro desktops and the new OptiPlex AIOs. You can add your own personal touch to these marcom assets for deeper engagement, while the quick-reference call scripts provided will equip your sales force with the right answers when engaging customers. All the assets are available for download on the Digital Marketing Platform, so that you can deploy the email and social content directly to your customers from the tool. You can also download the newest OptiPlex Family Brochure now available and tune into the webinar find out how you can transform your customers’ workplace into a hub of productivity. 1 Based on a Forrester Consulting Custom Technology Adoption Profile Commissioned by Dell. The Rise of The Micro PC: Security and End User Productivity Benefits Drive Increased Micro PC Adoption, February 2017. Results were based on a study consisting of 103 business and IT PC decision makers or influencers in North America. The study was completed in December 2016. 2 Improving Employee Productivity with Dual Monitor, IDC InfoBrief, sponsored by Dell, November 2015. 3 Savings are estimates based on a Dell analysis comparing costs of several system management cost scenarios, such as OS deployment, power management and BIOS changes. Cost projections based on U.S. data dated 2007-2016. For more information, speak to your Dell Sales Representative.